People born under the Ox Aquarius sign are likely some of the most curious people you will ever meet. They can be exceptionally smart and hardworking to a fault. They have big ideas that they have no intention of allowing to simply remain ideas. It’s tempting to think of Ox Aquarius as the cartoonish mad scientist or absent-minded inventor making fantastic machines in his basement, but in reality Ox Aquarius are much more grounded than this. They have many layers to their thinking, but are always fair with others. They are not overtly social, yet they work extremely hard on projects with the intention that others can benefit from them. The best way to describe a Ox Aquarius is as a person who works hard to succeed, but has to do things their own way. 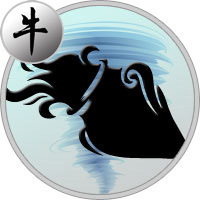 Ox Aquarius aren’t inherently rebellious, they just know what needs to be done and trust themselves to do it. They don’t like to follow the typical ways of doing things, mostly because they’ve already figured out how to do them better. Two personalities coexist permanently within you, one being original and charming, and the other free, independent, weird. You’re conscious of concrete realities, with a constructive and materialistic side, and at the same time prone to illusion and utopia. In this way, your life is often fraught with dramatic turns of events, which don’t disturb you excessively but which are harrowing for your close ones. Your sincerity is admirable. But your frankness is often brutal because you neither know how nor want to spare the susceptibilities of others. "They only have to justify or defend themselves", would you say. You’ve the sense of well-done work. But your exaggerated obstinacy or errors of judgment can make you have dramatic failures. As far as money questions are concerned, you must beware of dubious relations or false friends. You’re gifted for all long-term jobs, but prefer working alone rather than in team. Heartwise, you often dream of impossible love affairs. Your sentimental relations are ordinarily incoherent, marked with absolute infidelity and total jealousy at the same time. Sometimes you become a slave of your own sensuality, thus finding yourself in paradoxical situations because of the discrepancy between your aspirations and your amorous outbursts. An agreeable home and children will constitute an important factor of stabilization for you.